has seen considerable changes in the last couple of years. This article is written by Elad Lahav, Software Developer, QNX Software Systems Limited. Adhering to real-time constraints with priority-based pre-emption. Simulating asynchronous I/O in the presence of blocking calls. for other serialization mechanisms, most notably for various lock implementations. in order to prevent race conditions among threads contending for the lock. forever. Spinning is also bad for power consumption. data type and functions is the subject of the following sections. Fast: Operations on uncontested locks do not require any kernel calls. Light weight: The cost of declaring a mutex is 8 bytes in the declaring process’ address space. No kernel resources are required unless a thread is blocked on a locked mutex. Non-recursive: An attempt to lock a mutex more than once by the same thread results in an error. Shared: A mutex placed in memory that is visible to multiple processes (e.g., memory obtained by mapping a shared-memory object) can be operated on by these processes as a single, common, lock. wrappers for the relevant kernel calls 1.
with a call to pthread_mutex_init(). The mutex is locked by this thread. The mutex is locked by another thread. There are other threads waiting for the mutex. invoking the SyncMutexLock() kernel call. There are other threads blocked on the mutex. The first case returns an error, while the second invokes the SyncMutexUnlock() kernel call. them to malfunction, without affecting the kernel or other processes. with a locked mutex whose owner dies unexpectedly, and more. up and attempt to lock the mutex. as a user-mode object cannot be used to store kernel pointers. bucket and a list of mutexes locked by a thread. other threads into the kernel. on the mutex waiting list, the owner field is set and the kernel call returns. hash table and on the list of mutexes held by the current owner thread. as blocked on a mutex. Adjust the priority of the current owner, if needed. 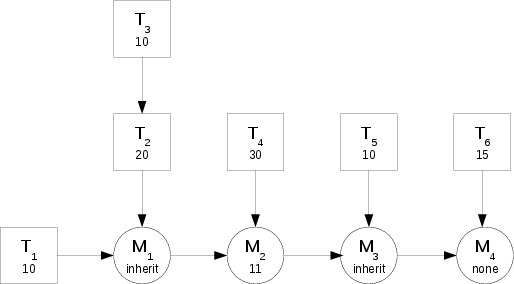 Priority inheritance: The priority of the owner thread is at least that of the highest-priority thread waiting on the mutex. Priority ceiling: Each mutex employing this protocol is associated with a fixed priority. The priority of the owner thread is at least that associated with the mutex. None: The mutex has no impact on the owner’s priority, and the user accepts the possibility of priority inversion. message from another thread) and its mutex-induced priority. the waiting list of each mutex. is 20, the effective priority of this thread is 20.
account for potential race conditions within the code. code in the QNX Neutrino microkernel. which are traps into the micro-kernel. poor design. Nevertheless, the kernel needs to deal with it correctly. Most interesting story here in years. Well done! Seriously.. great story. Finally something with meat again and no froth or bubble in sight. Most of this is over my head (I’m not a developer by any stretch of the imagination) but this was well written, easy to read and a wealth of information about an old favorite OS. Bravo! A piece about Operating Systems, finally! I have a question; is the neutrino internal threading model based on pthreads, or does it have a different native model onto which they get mapped? PS. I used to develop on QNX. I really miss the pervasive message passing, basically its programming model. For the most part, the pthread API is implemented as a thin layer on top of the native thread API, e.g., pthread_create() does very little other than invoking the ThreadCreate() kernel call. Also, are there any plans to support QNX on low end ARM systems like Raspberry Pi? Yes, the kernel calls are exposed and documented, and you can use them directly. For most pthread functions, however, there is little reason to do that (and, in fact, for mutexes, you will get sub-optimal results from going directly to the kernel calls, as explained in the article). For low-end systems, you should be able to run QNX on any ARMv7 or x86 system with an MMU, so Pi2 is feasible, but not the older Pi (ARMv6 processor) or Cortex-M-based systems (no MMU). Again, thanks for the answers much appreciated. In a recent project, I encountered bugs due to undefined conditions of the pthread mutex. I needed to capture a mutex, hold it across thread invocation, and then release it. Turns out that there’s no defined behavior in this scenario. If a thread attempts to unlock a mutex that it has not locked or a mutex which is unlocked, undefined behaviour results. So I opted to use the posix semaphore mechanisms sem_post sem_wait instead, which behaves as expected even under edge conditions. I wish I could change one thing about posix semaphores: that one could wait on any number of events instead of decremented them one at a time. If 20 threads call sem_post(semaphore), the blocking thread has to call sem_wait 20 times just to decrement the counter back to zero. Turns out Linux kernel devs recognized this deficiency and corrected it with eventfd, although it’s proprietary to linux and uses a new read/write syscall API. If you are waiting on an event that can be generated by any, or even multiple, threads, then semaphores are not what you are looking for. Perhaps a condition variable? Also, note that semaphores and mutexes, while sometimes confused for one another, achieve completely different tasks: the first are a synchronization (i.e., temporal) mechanism, the second a data-protection (i.e., spacial) mechanism. Search for “Concurrent Urban Legends” by Peter Buhr and Ashif Harji. Interestingly, your original goal, that of explicitly handing over a mutex from one thread to another without releasing it is something that has come up several times in the past. It’s not hard to implement, I’m just not sure that the semantics of such an operation are fully understood. No actually, the purpose of the mutex was really just to protect a data structure from concurrent access. [q]Interestingly, your original goal, that of explicitly handing over a mutex from one thread to another without releasing it is something that has come up several times in the past. It’s not hard to implement, I’m just not sure that the semantics of such an operation are fully understood. Once the error was tracked to the mutex, it wasn’t hard to fix: just replace the mutex with a posix semaphore. It’s semantically identical to the mutex, with the benefit of having defined behavior across threads. Oh sorry, you were talking about my other example. Yes a pthread condition variable might work there, there are many options really. AFAIK pthread condition variables only support mutex synchronization which can potentially block the sender when it needs to change the predicate condition variable. The block would only be momentary, but with asynchronous programming the main thread should not enter a wait state to wait on locks in other threads – it goes against the design. I felt a spinlock was the best choice here to protect the thread data queue. Both linux eventfd and semaphores (and even pipes) allow us to send events without risk of putting the main thread in a blocked state. 1. Any thread can signal the semaphore, leading to a loss of mutual exclusion (which will go unnoticed until data corruption is observed). 2. No way to avoid priority inversion. You may not care about these problems in this particular case, but it is important to understand the semaphore/mutex divide. Notice in the link I provided earlier that the pthread mutex behavior is undefined for the conditions where one would try to signal from another thread. It means that no code which correctly uses the mutex is allowed to attempt to signal the mutex from another thread. The fact that the semaphore defines and/or behaves differently for those conditions doesn’t make it any less suitable as a mutex in code which makes no assumptions about those conditions. For all conditions that are defined for the mutex, the semaphore works the same way. In other words, I think the semaphore pseudocode I gave above would be a valid implementation of a pthread mutex. Note that I agree with you that a mutex is generally the accepted mechanism to use to serialize access to a data structure, but I’m not able to come up with examples where a semaphore doesn’t work…can you come up with any counter examples? [q]2. No way to avoid priority inversion. Even with a mutex, a low priority thread can block a high priority thread. Am I misunderstanding you? It may be undefined in the spec, but it is certainly defined if you are using error-checking mutexes, which is the default on QNX and optional on Linux. [q]Even with a mutex, a low priority thread can block a high priority thread. Am I misunderstanding you? Read the article 😉 With priority inheritance (again, default on QNX, optional on Linux), the low priority thread will be boosted to the priority of the highest waiter until it relinquishes the mutex. It’s true error checking extensions can help catch code that triggers undefined mutex behavior. One could implement the same optional error checking with semaphores too, but I think it is unfortunate that useful scenarios were left undefined in the first place. Now we’re forced to “reinvent the wheel” just to work around the cases for which a mutex is not properly defined. Alas, it is what it is. [q]Read the article 😉 With priority inheritance (again, default on QNX, optional on Linux), the low priority thread will be boosted to the priority of the highest waiter until it relinquishes the mutex. I did read it, thank you for the article by the way. This is a good point, you can’t really bump the priority of unequal threads when the kernel doesn’t know which thread will release a lock. Maybe there should be a well to tell it. Now we’re forced to “reinvent the wheel” just to work around the cases for which a mutex is not properly defined. Alas, it is what it is. It is not “properly defined” to increase the chance more optimal implementations are possible without having to support weird usages such as “lock mutex in one thread and unlock in another”. Exactly why you had to lock it in one thread and release it in another is still not clear (to me), but I’m guessing there is a good chance that some of the other pthread primitives available would have been a better fit for the problem at hand. It’s not really as weird as you might think. Your thread is holding a lock and wishes to finish the request in a new thread without blocking the main thread. Therefor the easiest most natural place to release the lock is in the new thread. This pattern comes up a lot as elahav said himself. Using a mutex is very desirable because it’s the conventional choice for protecting resources from concurrent access, the only problem is pthread’s implementation doesn’t allow it here. Since a semaphore closely resembles the mutex’s normal semantics with the added benefit that releasing the lock from a new thread is well defined, it seemed like the best alternative. However elahav was very observant and pointed out that thread priority bumping would be lost with semaphores. Hypothetically we could have used a mutex from Thread A, spawned thread B to do the work needed, and then used signaling back to A to release the mutex. While this would have worked using only defined pthread mutex operations, the kernel still would have gotten the thread priority bumping wrong because it doesn’t know that thread B needs to finish it’s work before thread A can release the mutex. I can’t think of an easy way to represent this complex thread inter-dependency to the kernel, it would be so ugly that nobody would really want to. I think the best solution would be if a locked mutex could be explicitly transferred to a new thread using a new pthread function. Not only would this resolve the issue of undefined behavior across threads, it would also resolve the issue of giving the correct thread a priority boost – something a semaphore can’t do. Locking something for this long a duration is really poor behavior and kind of ruins the point multi-threading in the first place. As a result, mutexes aren’t designed for this. Using a mutex is very desirable because it’s the conventional choice for protecting resources from concurrent access, the only problem is pthread’s implementation doesn’t allow it here. A mutex is designed to mutually exclude access to a resource for a short duration of time. It is intended for the situations where your data won’t fit into atomic operations. What you are trying to do with the mutex IMO doesn’t fit into the intended usage pattern of that construct and it shouldn’t even try to support it. It is like complaining that a std::vector doesn’t scale for very large lists where you should have used std::list or some other container type instead. Since a semaphore closely resembles the mutex’s normal semantics with the added benefit that releasing the lock from a new thread is well defined, it seemed like the best alternative. However elahav was very observant and pointed out that thread priority bumping would be lost with semaphores. Not knowing the code and problem at hand, I can’t say for sure exactly what you should have used instead of a mutex. Maybe it should have been semaphores, maybe condition variables, maybe pull the working set out of the mutex protected data and put it back in when done. In any case, if posix mutexes had been forced to support what you’re asking for they might have taken a performance hit for their intended usage. Typically when I end up in situations requiring solutions as creative as you just described, it is almost always a sign that I somehow ended up over-complicating things and there’s a much simpler problem to solve if I just change my approach. In this case, the key question to ask is probably somewhere along the lines of: Why do I need to maintain such a long lock in the first place? Is there a way to avoid it? Keep in mind that when posix was originally defined CPU architecture looked quite different from what it did today. When doing an standard like pthreads there’s a fine balance between defining something too exact that will lock it into current architecture and algorithms, and too loosely so that the standard is effectively useless. Even if you could today (on Intel/AMD hardware) make your cross-thread mutex lock/unlock without cost, it might not translate to future architectures. No doubt the computing world look very different. Locking something for this long a duration is really poor behavior and kind of ruins the point multi-threading in the first place. As a result, mutexes aren’t designed for this…. That’s not really true though, locking will take however long it needs to take depending on the context. In an intensive simulation, something may lock for a long while and be perfectly normal. Obviously you wouldn’t want to do that for a GUI, but it depends on the context. There’s nothing wrong with longer locks if that’s what the granularity of the problem calls for. Secondly, it’s quite reasonable to use a mutex for shared file descriptors or whatever else even if they’re known to block. If we were talking about a spinlock, then I would agree with you that any blocking is bad, but with a mutex that’s not true. The mutex would become much less useful if you couldn’t perform blocking operations while holding a mutex lock. Thirdly, starting a new thread is not a blocking operation anyways. We can start many such threads on a multicore CPU in the same time it takes to complete one blocking disk or network operation. The “long duration” argument against passing a mutex into threads doesn’t really hold up. In any case, if posix mutexes had been forced to support what you’re asking for they might have taken a performance hit for their intended usage. There wouldn’t be a performance hit at all, it’s already locked, you just need a syscall to tell the kernel about the new thread association. Code that doesn’t invoke this syscall wouldn’t change. It might not have been clear that paragraph was describing the convoluted approach needed to use the mutex as is today from a single thread. If it were fixed, it would be just as straitforward as the single threaded case. Switching to semaphores is dead simple, maybe this discussion should end on that. However when elahav pointed out the fact that semaphores can’t tell the kernel which thread to prioritize, it made a good argument as to why mutexes would have been better assuming this case was implemented. [q]Keep in mind that when posix was originally defined CPU architecture looked quite different from what it did today. When doing an standard like pthreads there’s a fine balance between defining something too exact that will lock it into current architecture and algorithms, and too loosely so that the standard is effectively useless. Oh well, that’s ok. It’s not like we carry any weight with IEEE or posix anyways. It isn’t so much a question not being allowed to perform blocking operations, but more that the longer time the mutex is locked the further you move away from what a (posix) mutex was intended for. Starting a new thread already makes me wonder things like why didn’t you acquire the lock in the worker thread in the first place? Your posix_transfer_mutex_to_other_thread(pid) function might not add much of an overhead, but if I was part of posix I’d want some kind of solid proof/example where it would be preferable other more well-known methods. [q]Oh well, that’s ok. It’s not like we carry any weight with IEEE or posix anyways. Indeed. Personally I’m not even remotely an expert in this subject – I just found your needs of a cross-thread mutex somewhat odd. Clearly you don’t and that’s OK.
You may not want other users coming in and grabbing the mutex between the time the thread is created and the time the thread grabs the mutex. Say the protected resource is a memory mapped file or a socket that must not be touched until the thread has unlocked them. [q]Your posix_transfer_mutex_to_other_thread(pid) function might not add much of an overhead, but if I was part of posix I’d want some kind of solid proof/example where it would be preferable other more well-known methods. To be honest I’m not too bothered about using a semaphore as a lock (with the caveats brought up earlier), but you will hear some groans in the community because a semaphore is meant for signaling rather than locking. In principal a mutex would be the correct primitive to use. Starting a new thread already makes me wonder things like why didn’t you acquire the lock in the worker thread in the first place? In that scenario, couldn’t you just have the thread remove the resource from global access until the new thread is created then hand ownership over when it is ready? Hopefully I follow your meaning… I’m really tired. Lookup object, lock mutex, remove object from collection, unlock mutex, invoke Thread B with object as parameter. Lock mutex re-add object to collection. This what you have in mind? Well, it kind of changes the semantics a bit. Thread C might come in and it won’t find the object, even though it’s supposed to exist. Also, Thread D might already be blocked on the mutex even before the object was removed from the collection. When Thread A releases the mutex, there’s no way to guaranty new Thread B gets it next. Maybe more synchronization and structures could solve it, but it adds quite a bit of complexity over just keeping the mutex locked across threads. We probably can’t beat the trivial simplicity of implementing our own mutex with semaphores ( http://www.osnews.com/comments/29090 ). Anyways thanks for the discussion, I won’t be around much this week. Thread C might come in and it won’t find the object, even though it’s supposed to exist. Yes, there will be a change in semantics. The way I may do it, seeing as I haven’t seen the code, is to make Thread C, D, etc operate expecting that they may not see the resource they wanted. In a way, they already do because they’re already expecting to have to own a mutex before they can use it any way. So if Thread D is blocked on the mutex, Thread A removes the resource from global access, once Thread D is unblocked, it won’t see the resource it was after. In which case it will have to do something else or wait until the resource becomes available again. What’s the best way to try out qnx these days? Is it available for download? Yes the desktop OS along with the dev SDK is available for download at the qnx website. However payed support costs an arm an a leg (or at least last time i tried it) so you are going to depend on written documentation and community for help unless you want to pay. What if I told you that for most cases you don’t need them? Would you believe me? What if I also told you would see dramatic increases in performance for those areas of code that had high levels of contention? It’s hard to say, because you haven’t provided any details. 1. Avoid data sharing, e.g., with a pure event-driven design or by a strict assignment of tasks to threads. While I often go for such a design myself, it does restrict parallelism, and therefore does not scale well with the number of processors. 2. Solve the data-sharing problem with lock-free data structures or read-modify-write schemes. These are typically harder to implement and are not always applicable. Nevertheless, the issue is a moot one as far as the article goes: 99% of the multi-threaded code out there uses mutexes, which means that the OS must support this mechanism.